Published: Dec. 2, 2018 at 01:21 p.m.
Miami Dolphins quarterback Ryan Tannehill finds wide receiver DeVante Parker for an 18-yard touchdown. Published: Oct. 26, 2018 at 01:00 a.m.
Miami Dolphins wide receiver DeVante Parker catches a 46-yard pass after the ball is popped out of wide receiver Jakeem Grant's hands in Week 8 of the 2018 season vs. the Houston Texans. 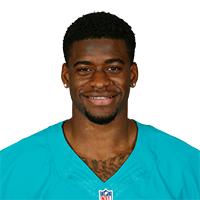 Published: Dec. 17, 2017 at 03:48 p.m.
Miami Dolphins quarterback Jay Cutler throws to wide receiver DeVante Parker for a gain of 36 yards.